May 06, 2005, L. G. Crabo. 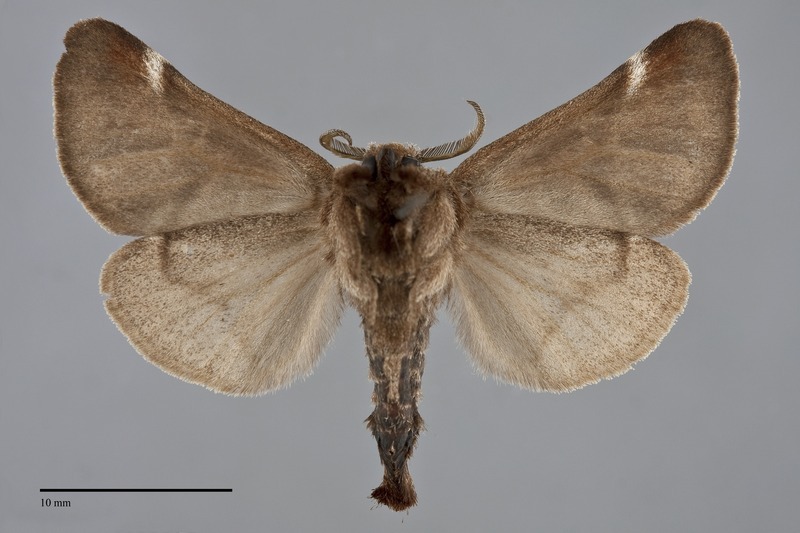 Clostera albosigma is a small to medium-sized brown moth (FW length 14–16 mm.) with an S-shaped white mark on the costa near the apex that flies in forests during the spring and summer. The forewing has a slightly concave costal margin and a rounded apex. It is medium-dark to dark gray-brown. The transverse lines proximal to the discal spot have light tan inner and dark outer components and are nearly straight across the wing. The postmedial line is similar but sinuous except at the costa where is forms a white "S." The anterior half of the wing distal to this mark is brick red and dark purplish brown. The hindwing is nearly even dark brown-gray. The top of the head, collar, and central thorax are smooth dark brown, contrasting with the lighter brown rest of the body. Like other Clostera species the antennae are bipectinate. The tip of the male abdomen is tufted. 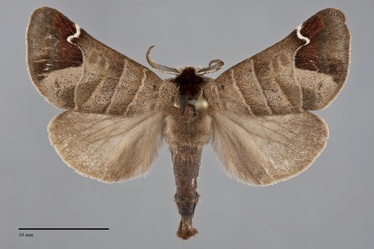 This moth can be identified by its brown forewing with straight pale lines and the characteristic white, brick-red, and dark brown apical markings. The other Clostera species in the Northwest are gray. The larva is dark gray with orange dorsal stripes and short scoli or tubercles. It is illustrated by Powell and Opler (2009). This species is usually uncommon. It occurs in moist riparian habitats along creeks and rivers, usually at low to middle elevations..
Clostera albosigma is widespread in forests in the Northwest, occurring as far south as the Willamette Valley in western Oregon, the latitude of the Blue Mountains in northwestern Oregon, Idaho, and Montana, and the mountains of southeastern Idaho. It has been collected as far north as the Peace River region of north-eastern British Columbia and the Skeena River Valley further west. This species is broadly distributed from coast to coast in North America. Its eastern and mid-Continent range extends from the Gaspe Peninsula of Quebec and the Canadian Prairie Provinces south to New Jersey, Missouri, Oklahoma, and Colorado. It does not occur much further south than Idaho and northeastern Nevada, with no known records from California. This species is a foodplant specialist on the Salicaceae, using both willows (Salix spp.) and cottonwoods (Populus spp.). Adults of C. albosigma have a long flight season and the phenology data suggests that it might be double-brooded in the Pacific Northwest. Collection dates range from late April to late August, with peaks at the end of May-early June and again in August. The adults do not feed. They are nocturnal and come to light. 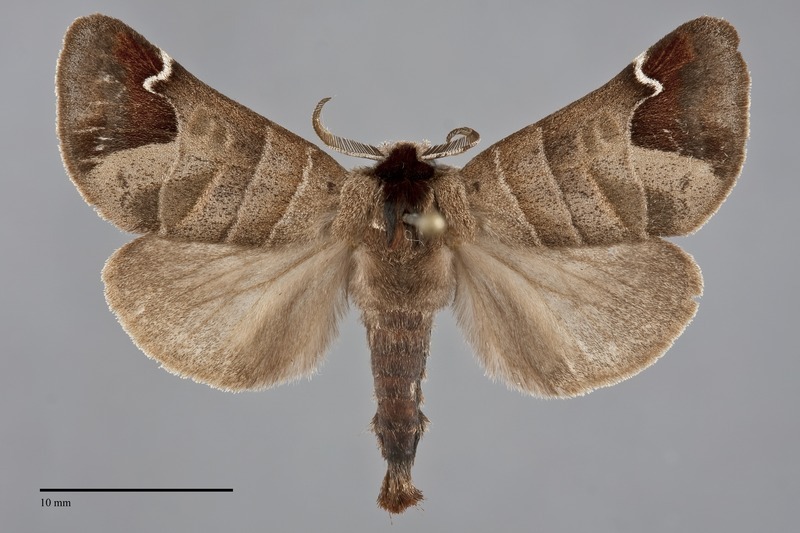 Moths of this genus have a curious resting posture in which they fold the wings tightly around the abdomen which is extended into the air.